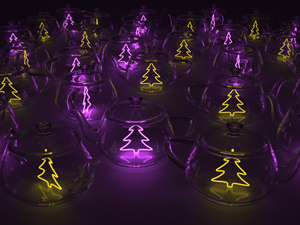 This entry, which was the overall winner and receiver of the audience choice award, is based on creating time-varying composites of light layers in order to simulate the effect of twinkling Christmas lights and flickering candles. 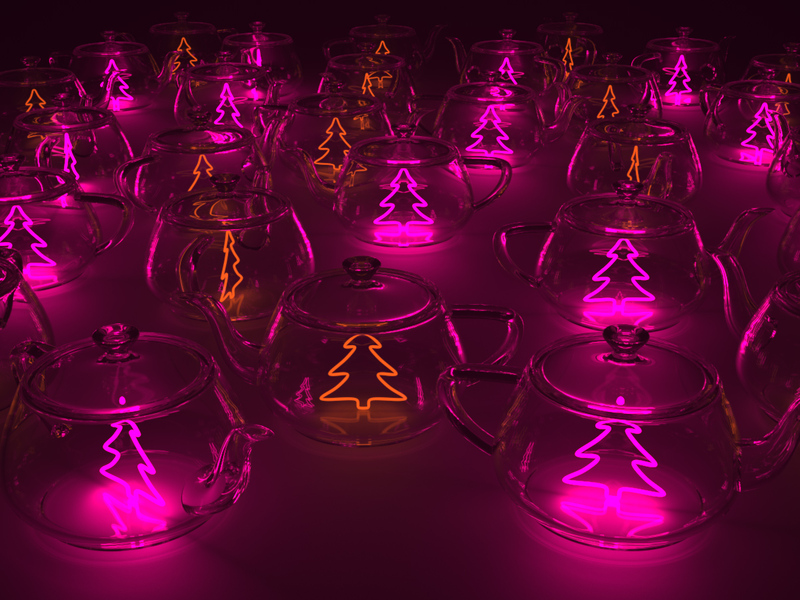 The scene has 30 lights, one inside each teapot. 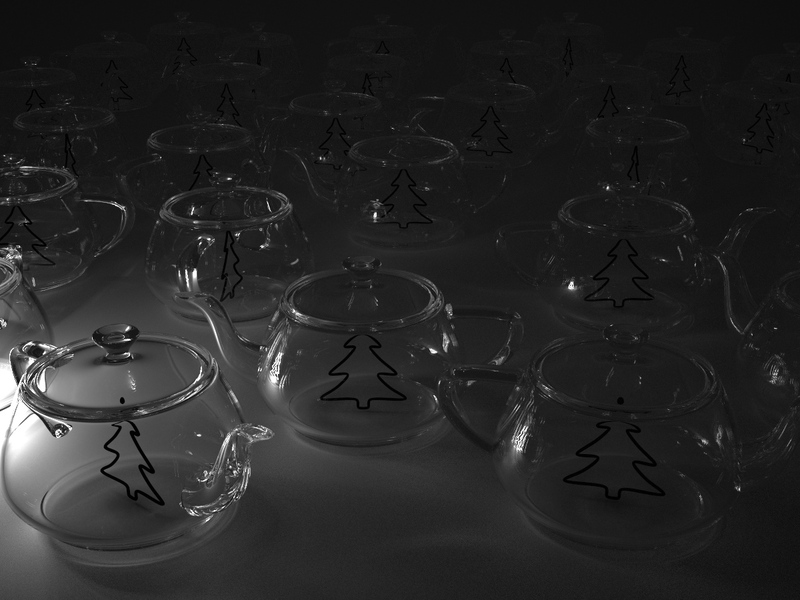 Light layers are created during rendering by saving the contribution of each light into its own image. 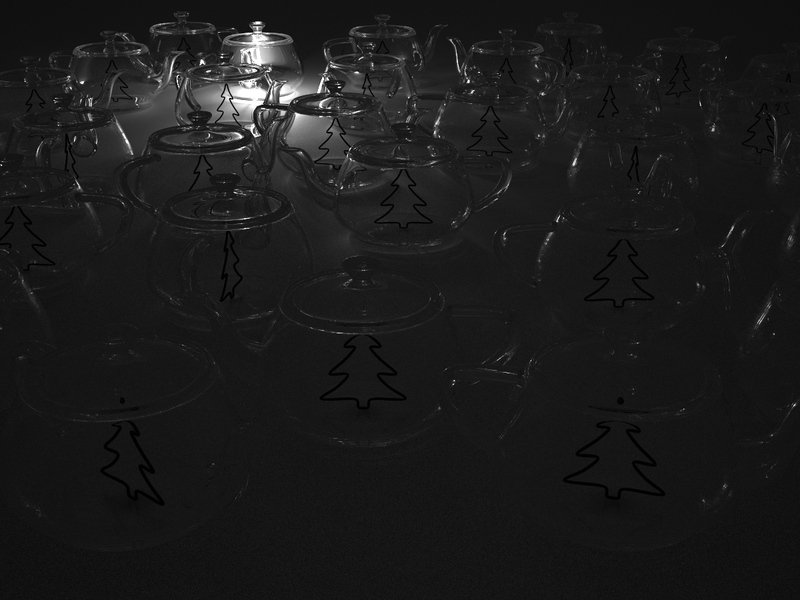 This produced 30 images/layers. 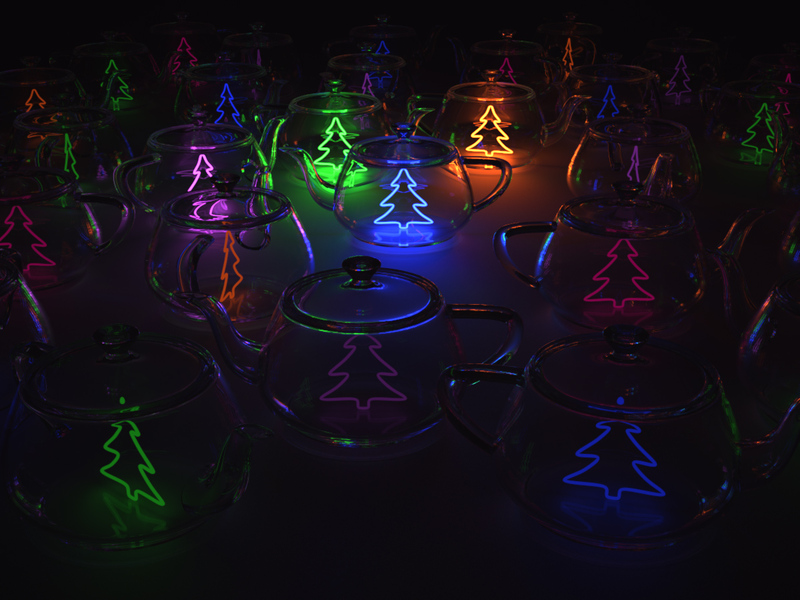 Each light produced 4,000 samples per pixel. 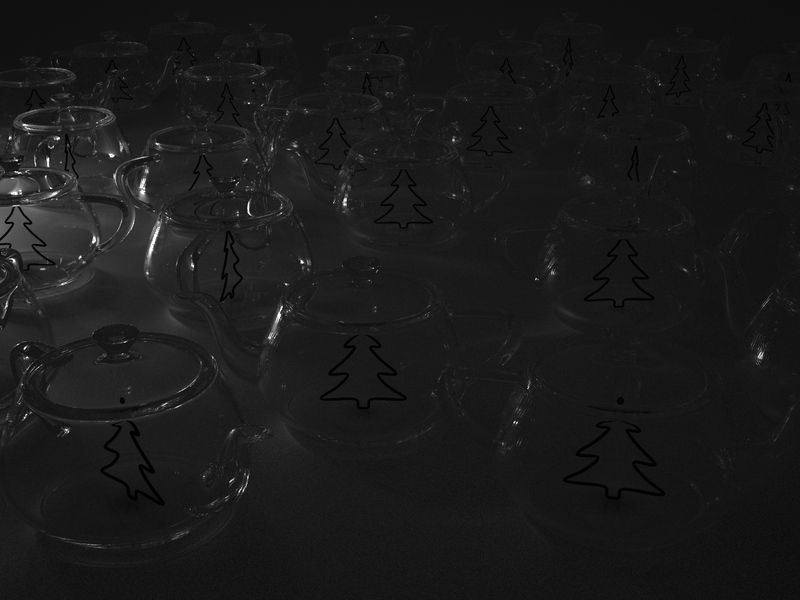 That adds up to 120,000 samples per pixel after compositing. 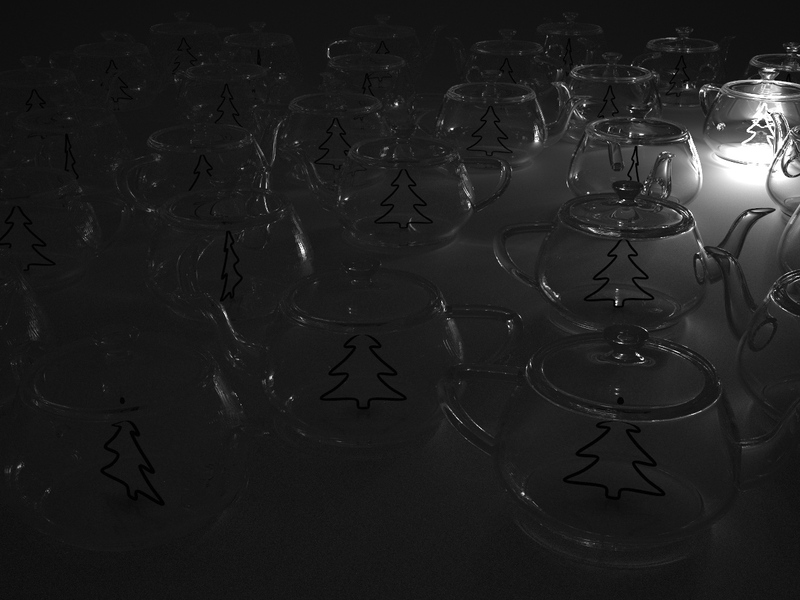 I allowed up to 10 diffuse light bounces and 200 specular bounces. 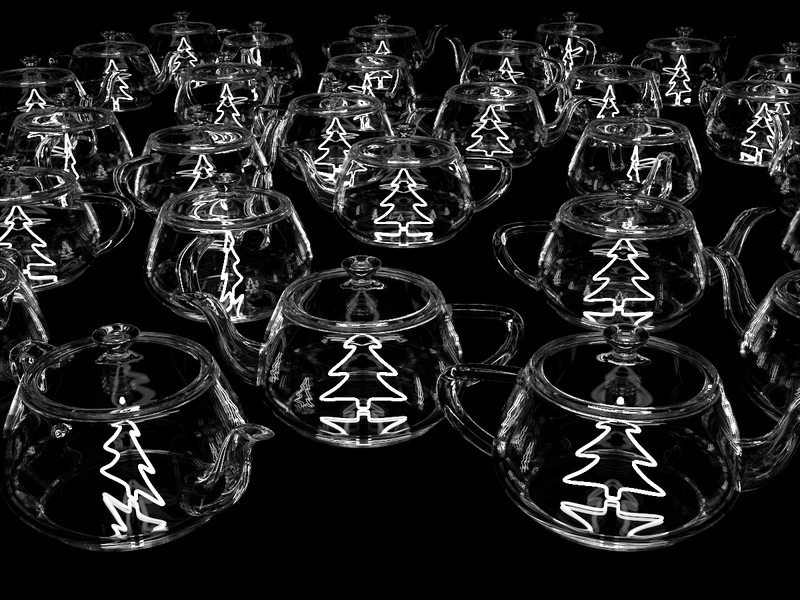 Download the high resolution video christmas_teapots.mp4 or christmas_teapots.mp4.zip. 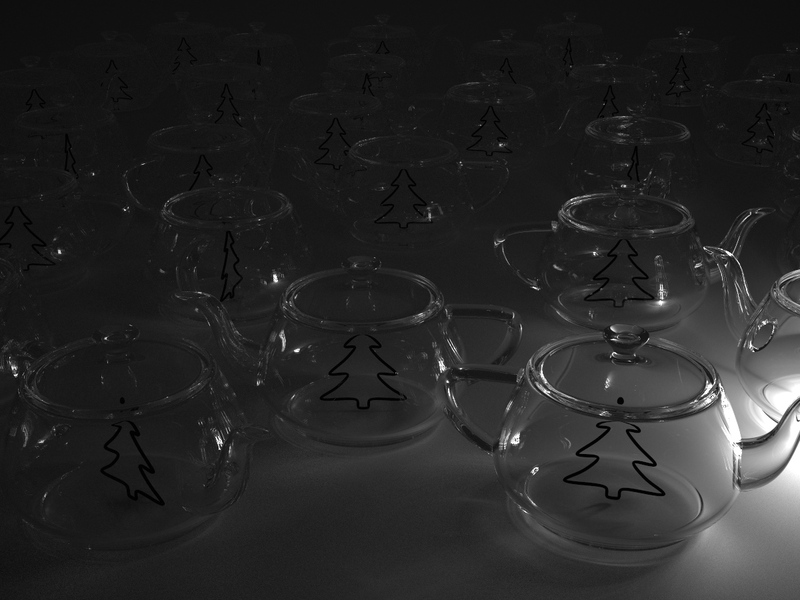 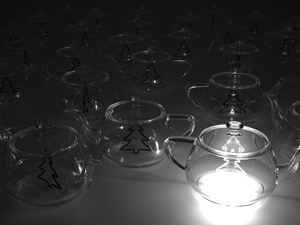 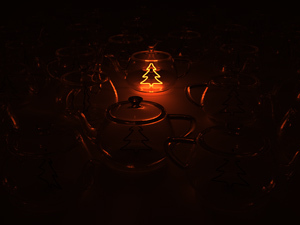 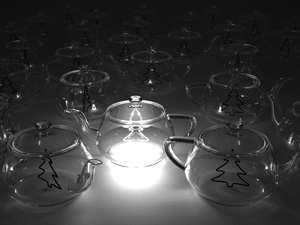 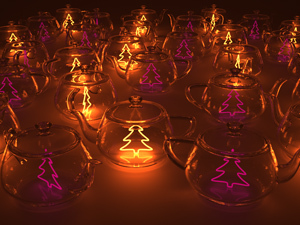 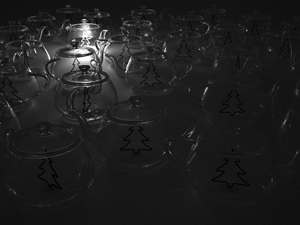 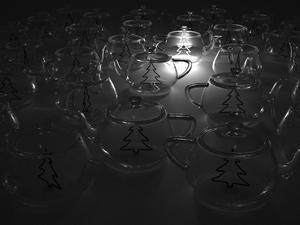 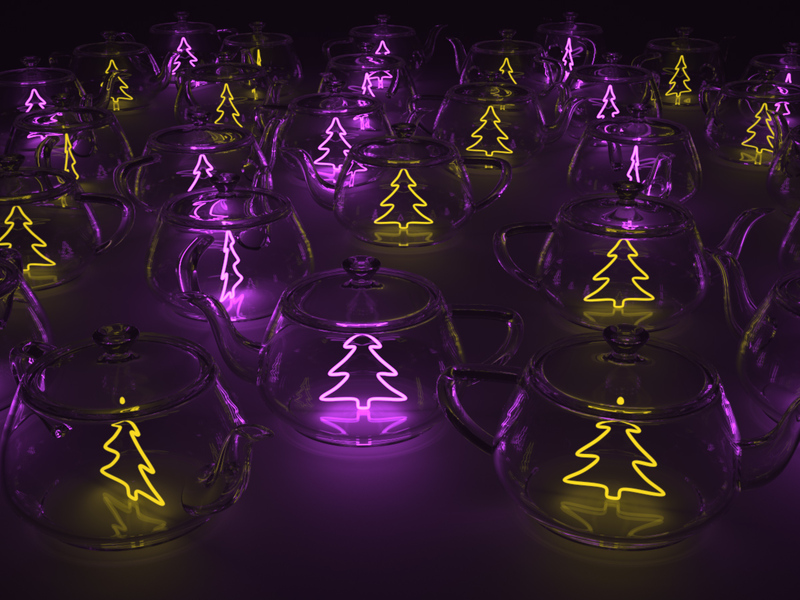 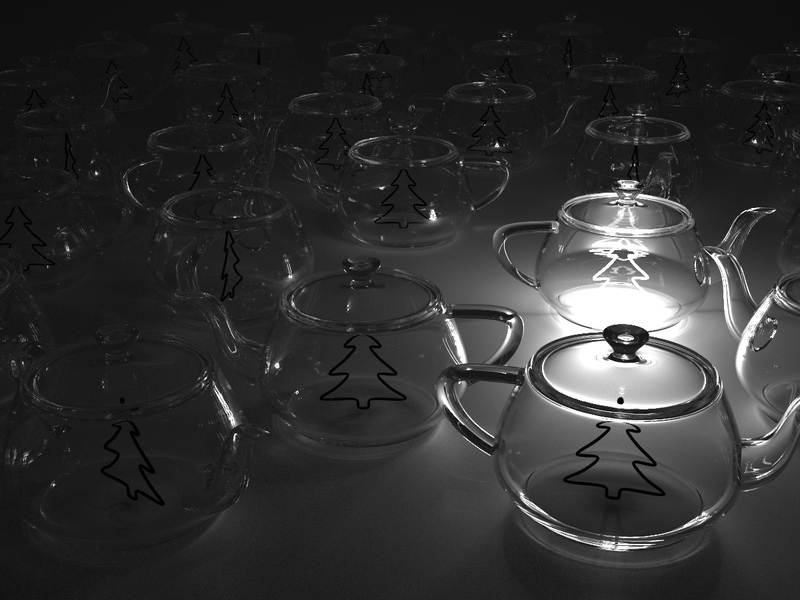 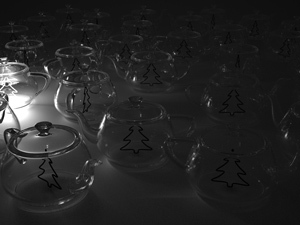 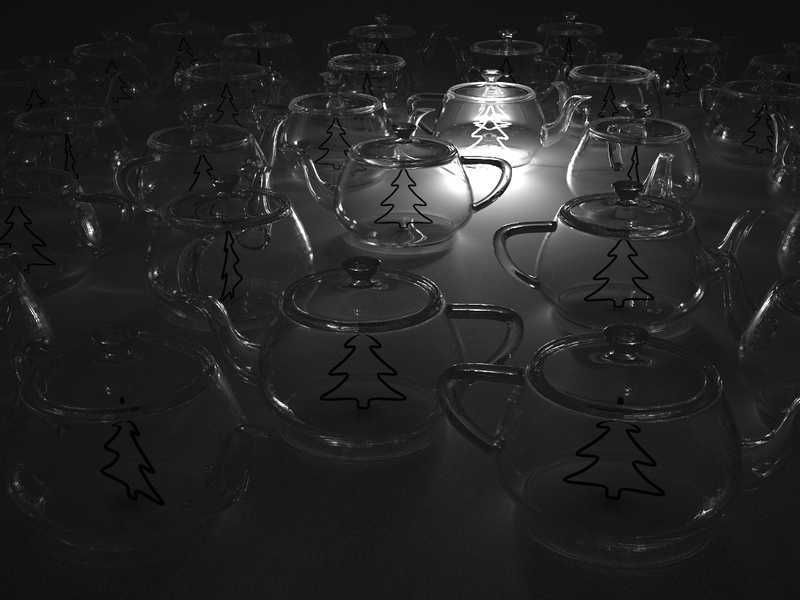 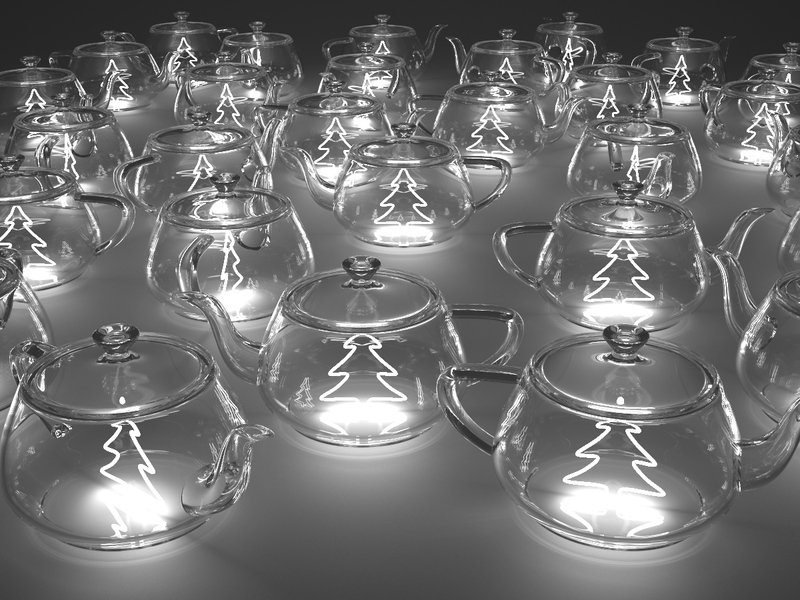 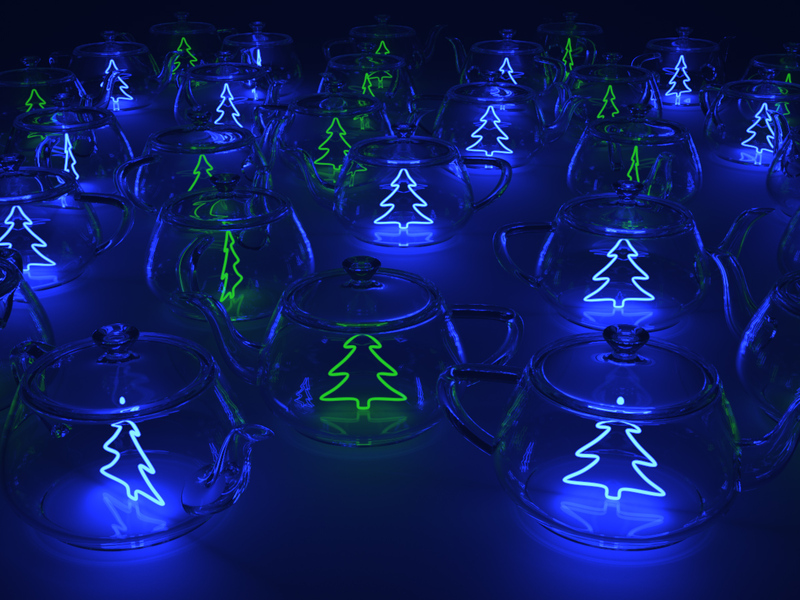 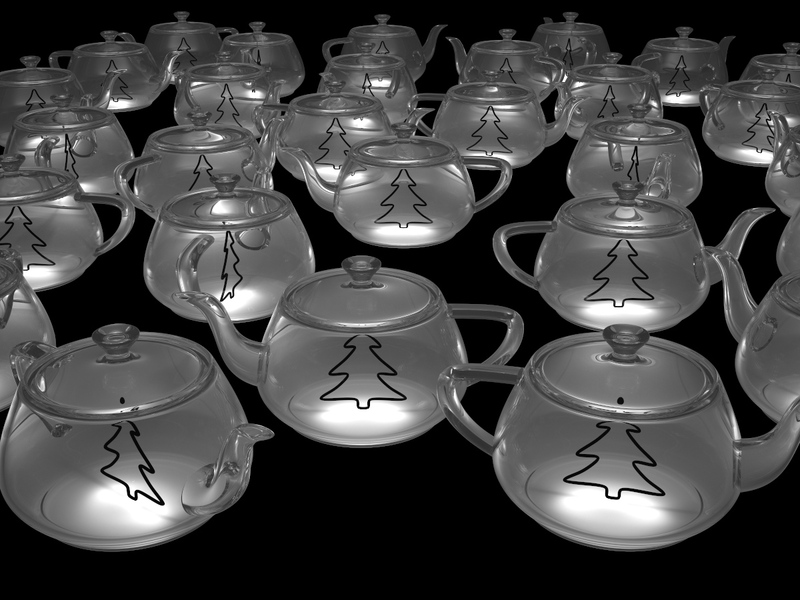 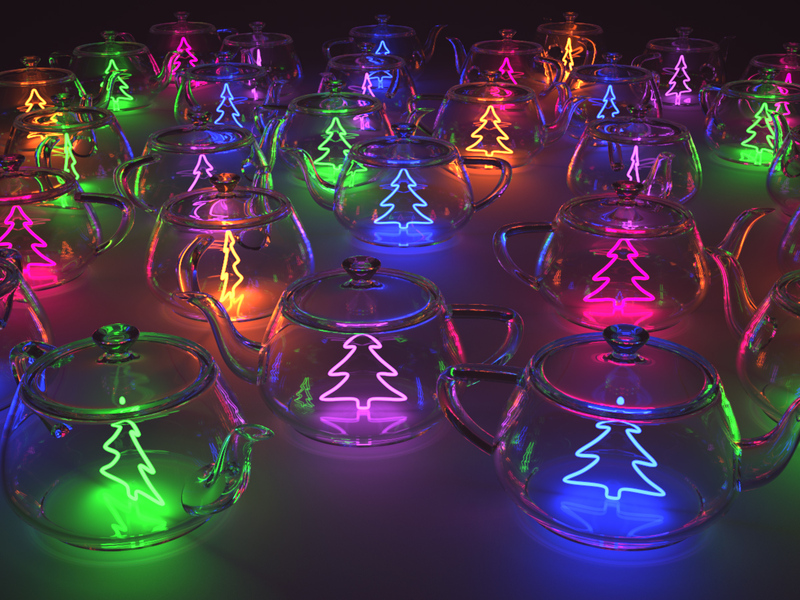 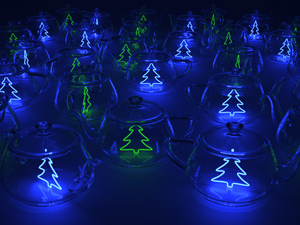 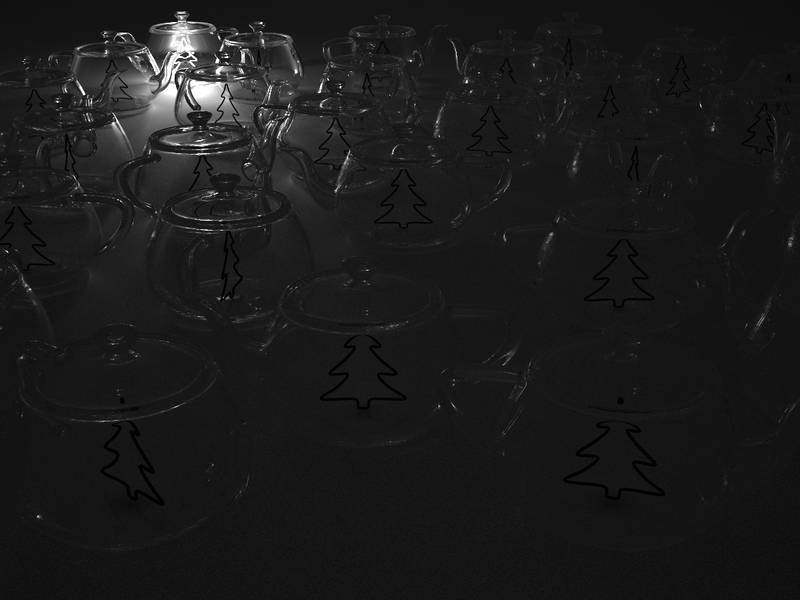 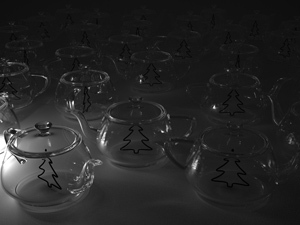 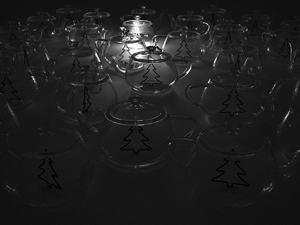 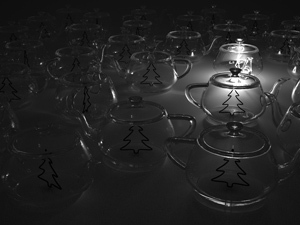 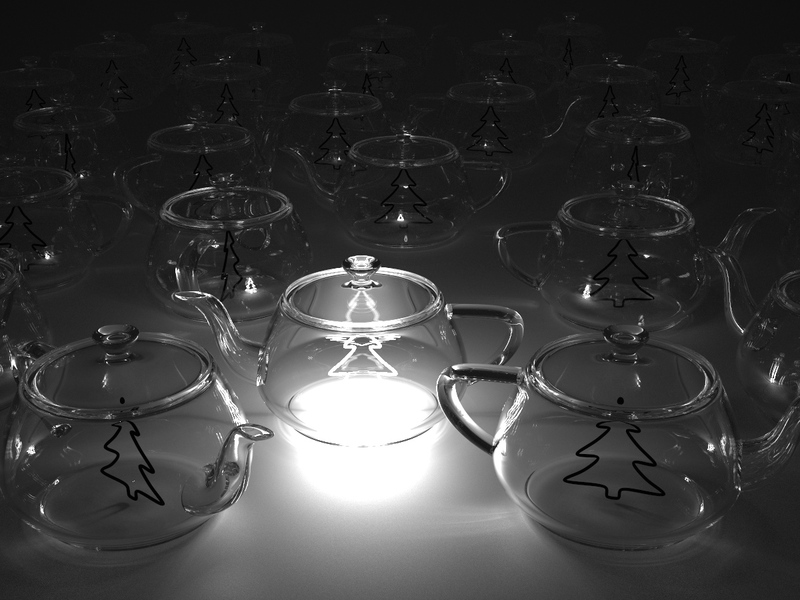 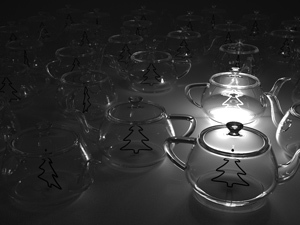 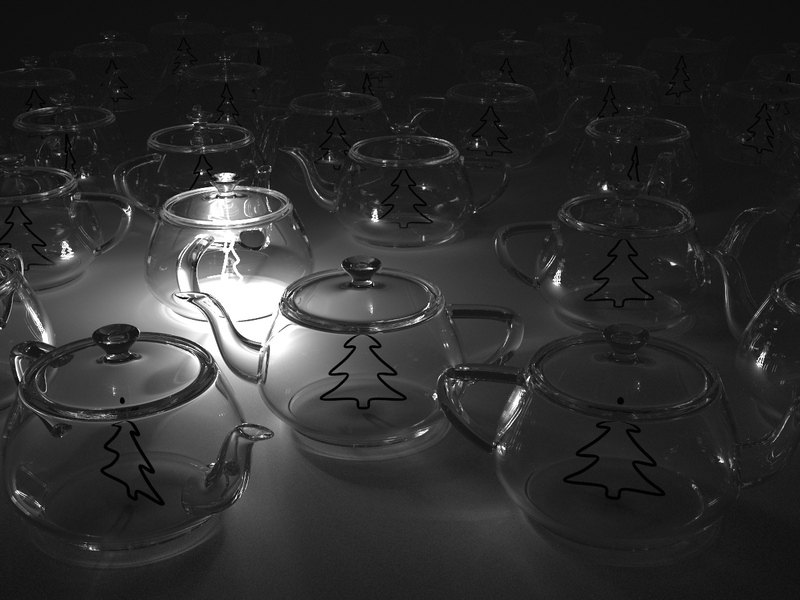 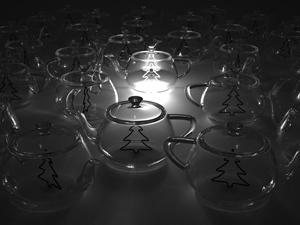 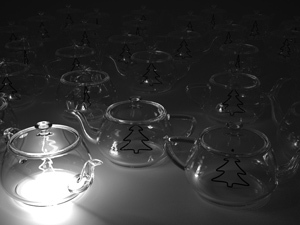 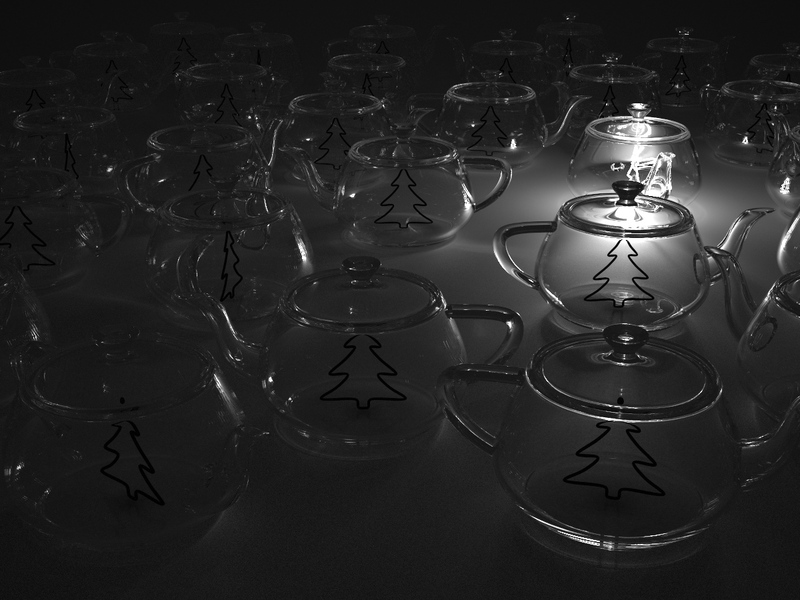 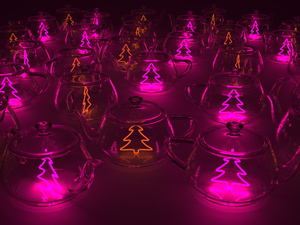 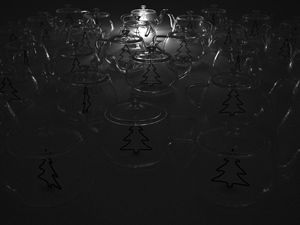 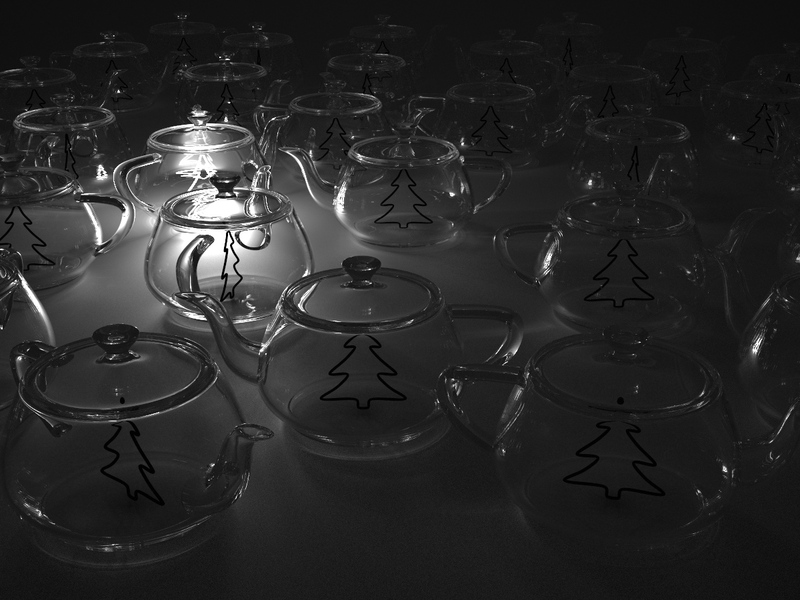 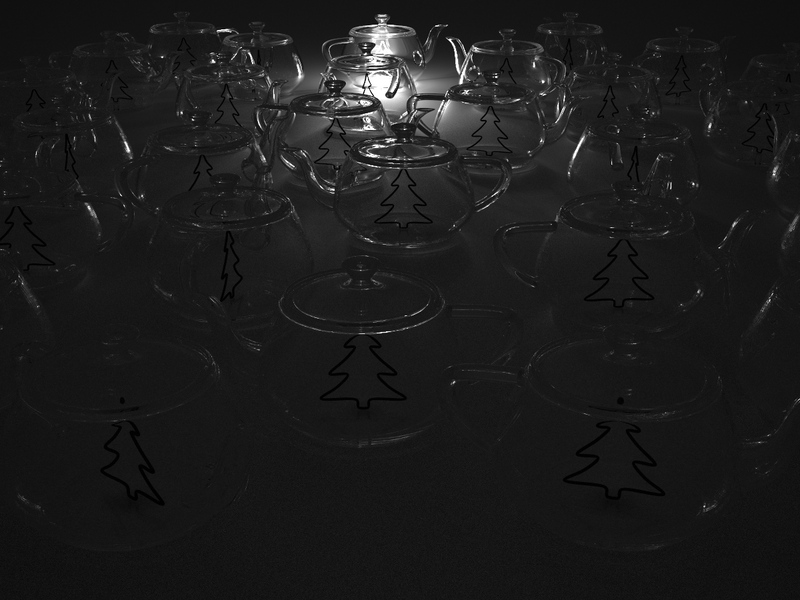 Here's a lower-resolution version christmas_teapots_low.mp4 that should play well in most players. 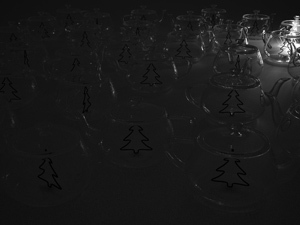 A good player is VLC. 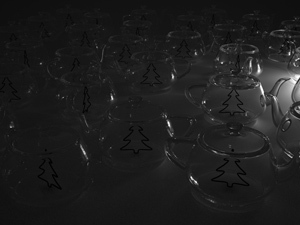 Some frames from the movie. My other entry. 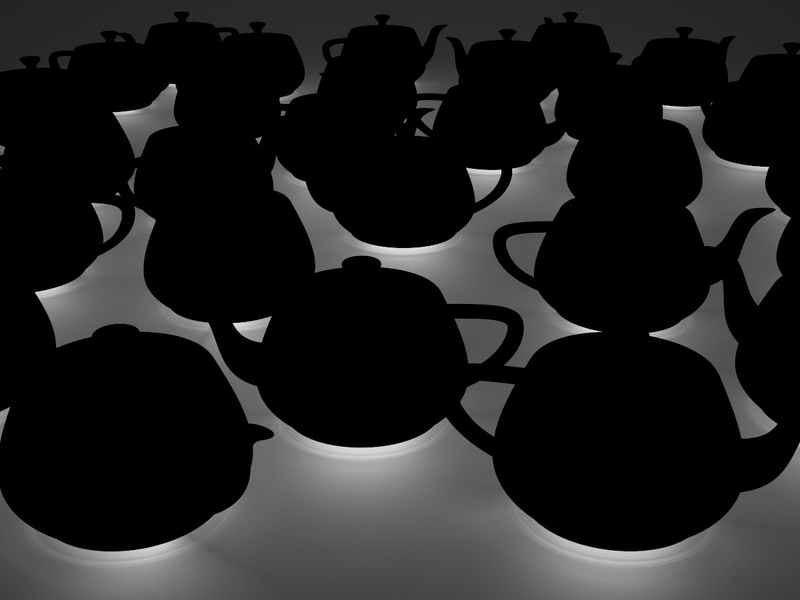 7,213 U logos inside a teapot. 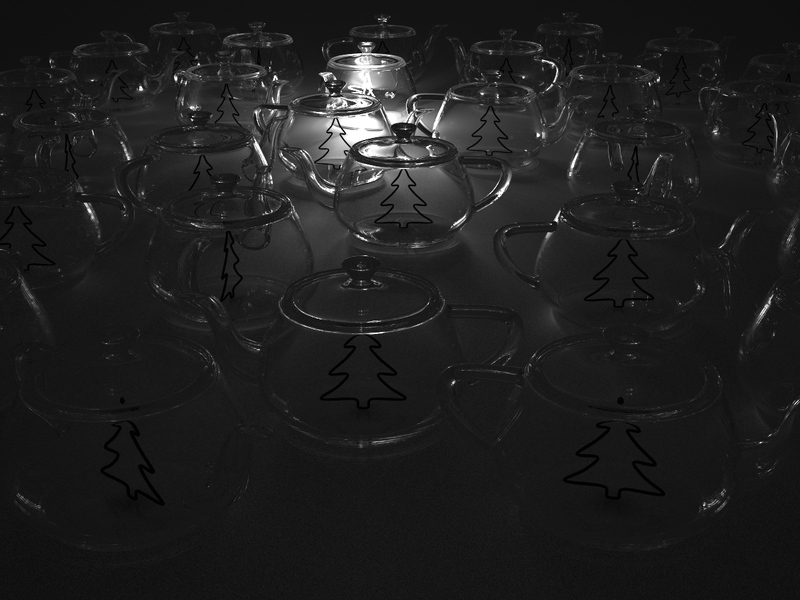 I used a rigid-body simulation to drop all the logos into the teapot. Classic path tracing was used with an environment light. 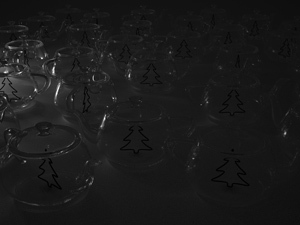 Up to 1,000 light bounces through the glass. 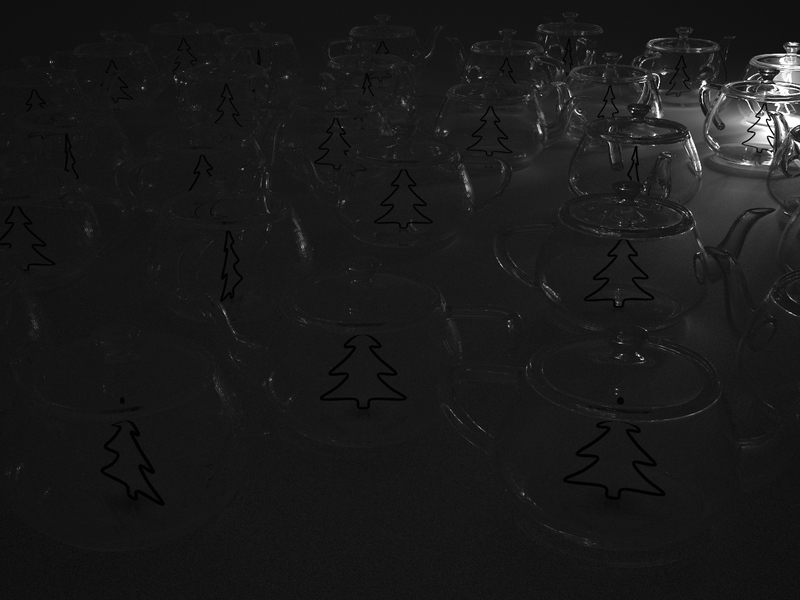 10,000 samples per pixel. 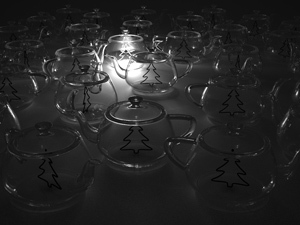 This is the image as it was rendered in grayscale, which is the composite of all the light layers. 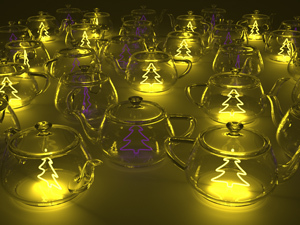 It was rendered using three different rendering techniques, which are shown below. 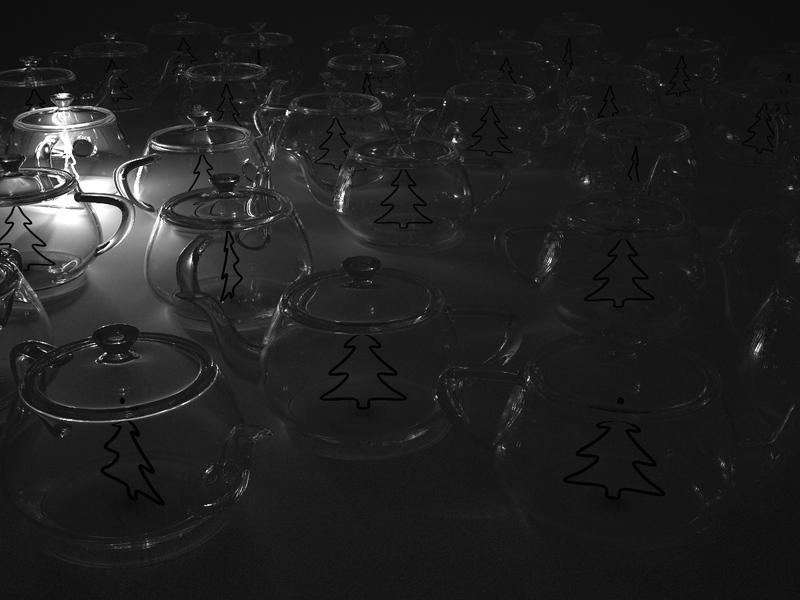 Photon mapping contribution. 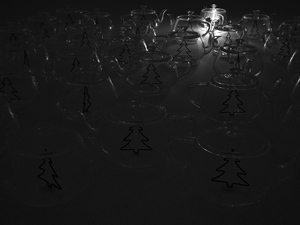 Photon mapping was the only technique that worked for illumination through the glass (specular-diffuse-specular paths). Path tracing could not explicitly sample the lights so the convergence rate would have been extremely slow. 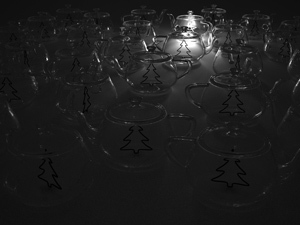 Photon mapping is a biased technique since it averages the illumination over an area. 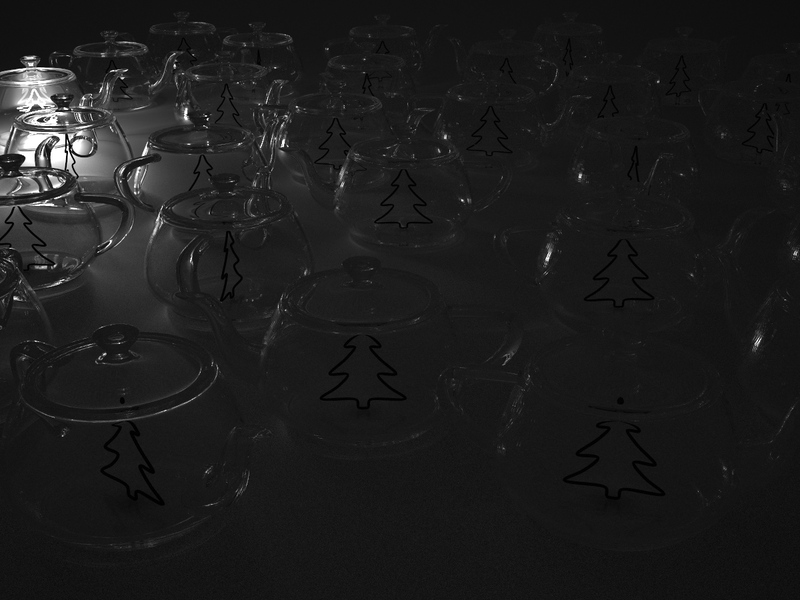 I made the area small enough so that the blurring effect was not noticible and large enough where the rendering converged at a similar rate to light tracing. 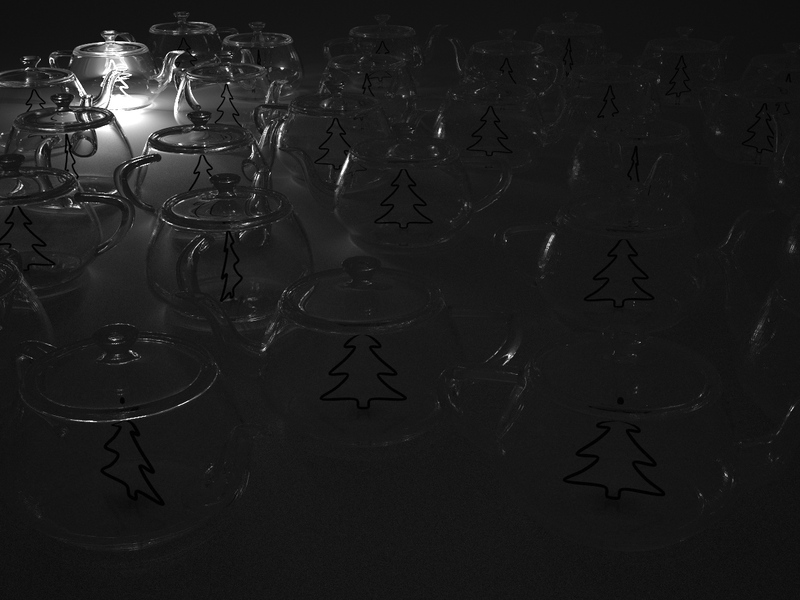 Path tracing contribution. These are the contributions from all-specular paths. These paths went from the camera, bounced around glass, and then hit a light. 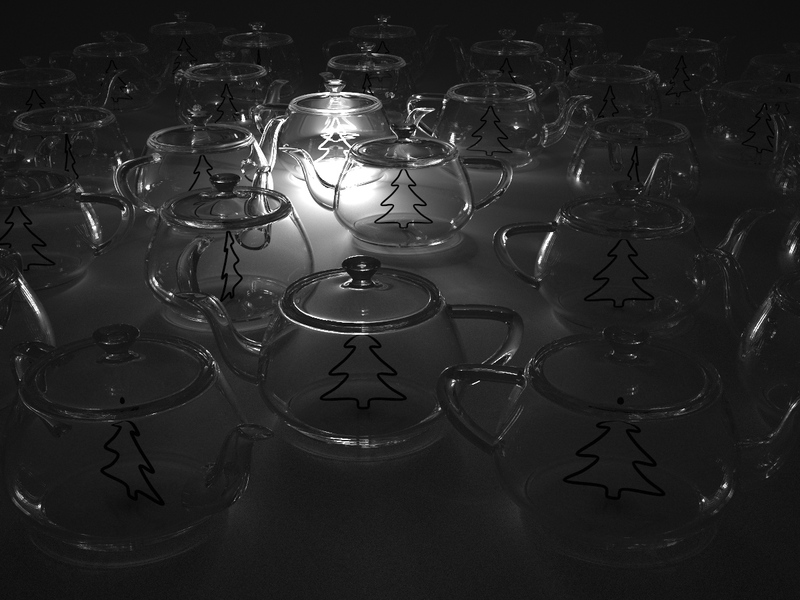 This is a brute force path tracing technique, and was required since both light tracing and photon mapping cannot render all-specular paths. Light tracing contribution. 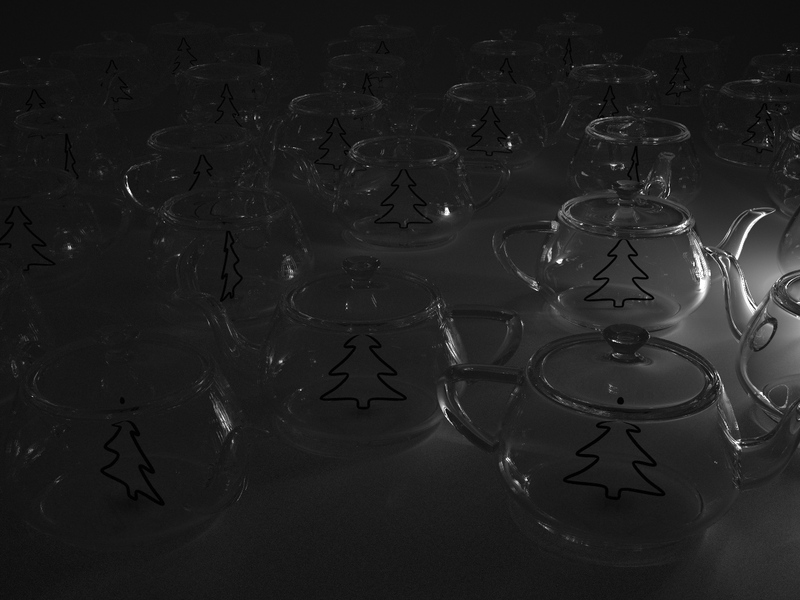 The ground is a diffuse surface so I chose to use the unbiased light tracing technique. Light tracing produces caustics while avoiding the potential blurring problems of photon mapping. 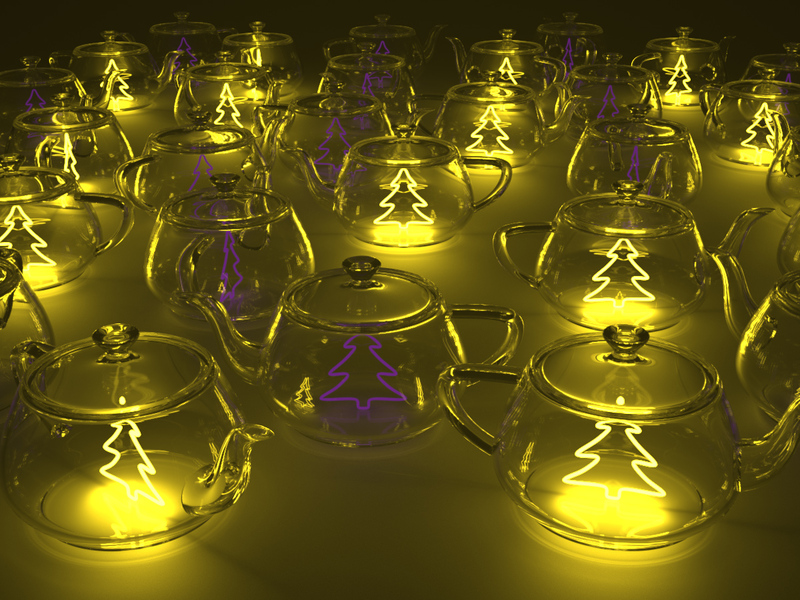 These are all of the light layers. 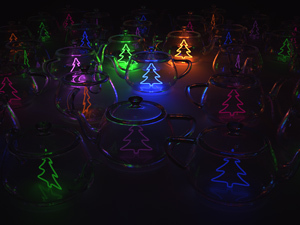 The animation was created by varying the color and brightness of each layer over time. 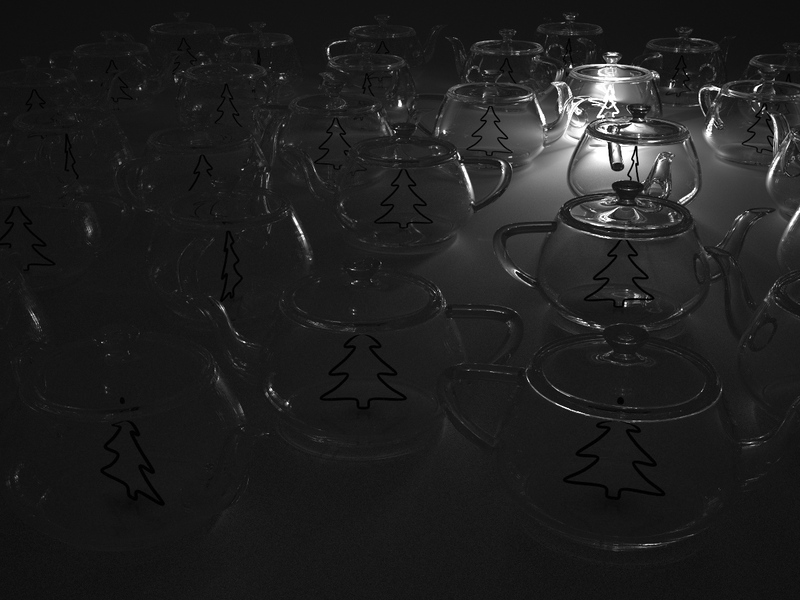 This is a little animation test I put together that cycles through all the lights. 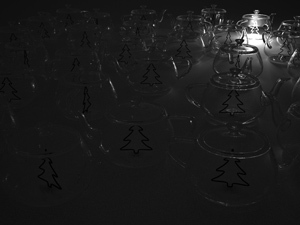 Download the high resolution video roll_call.mp4 or roll_call.mp4.zip.